Barb now understands that perfection in art often robs a painting of its freshness and spontaneity. She also understands the need for breaks from intense painting sessions. A few days ago we took a break and watched my friends harvest a shrimp pond near the Riverhouse. I love looking out my window and seeing a harvest underway! Cesar Cevallos seems pleased with the day’s harvest. From the outlet pipe to large containers to the crates. 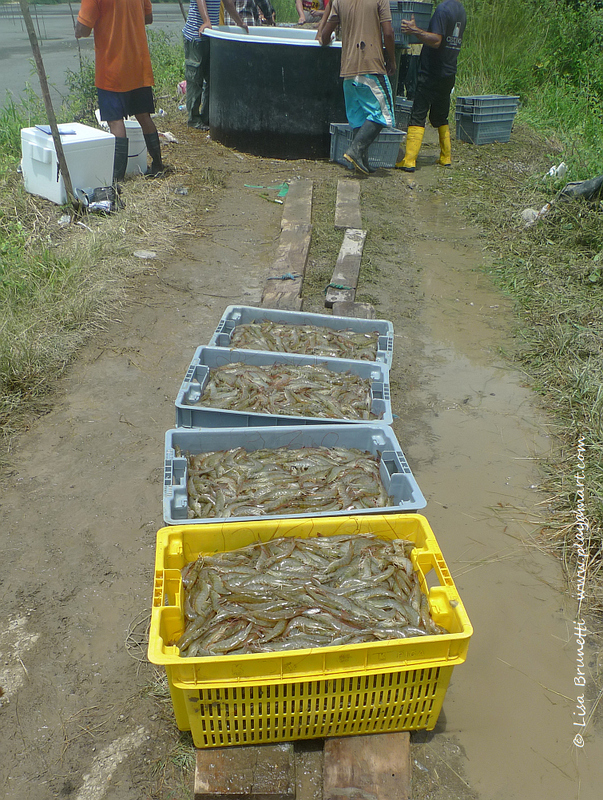 After the water drains from the crates, the shrimp are weighed then transferred to the truck. From the crates to the truck – pond to ice in a very short period of time. View of the outlet pipe, almost-drained pond, and Jama in the distance! After the short break, we returned to the house to resume painting. Barb often dabbed more paint on her hands, arms, face and clothes than on the painting. I volunteered to upgrade her paint-soiled clothes to a fashion statement! 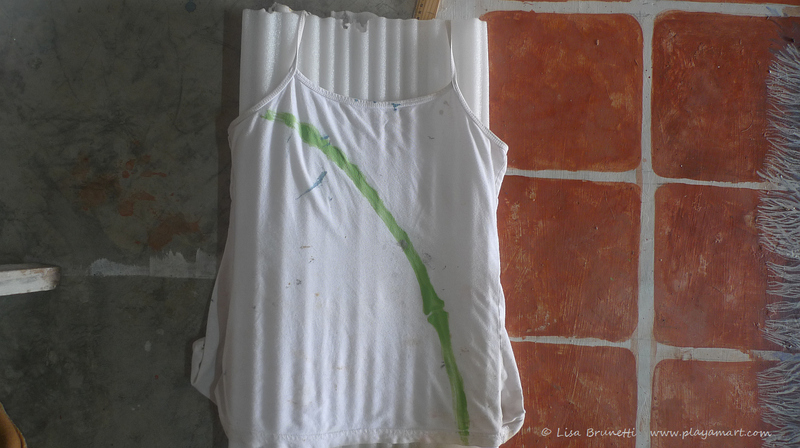 What to do with a soiled shirt! 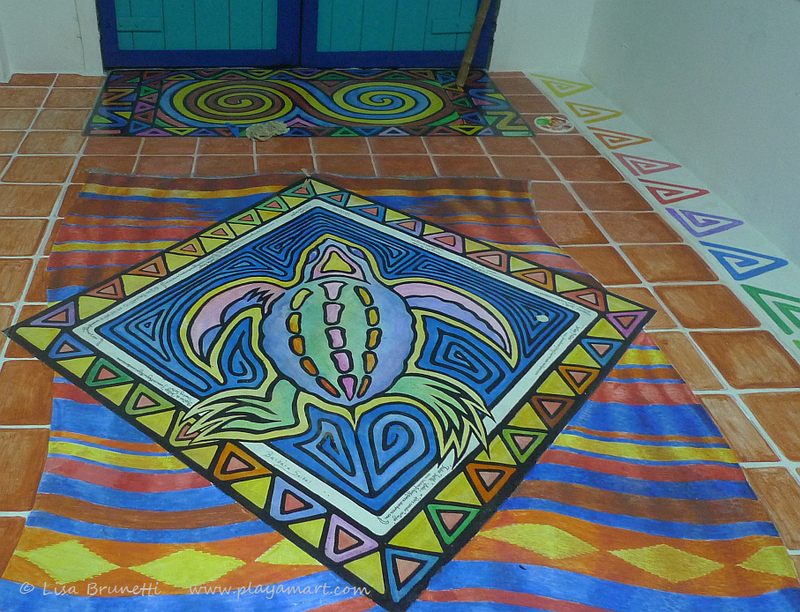 What to do with leftover paint! The shirt looks much happier! This post will find its way to you when Barb and I are watching the sun rise from a southbound bus for Guayaquil. Seven hours after our journey begins, we will arrive in Guayaquil. On Sunday morning she’ll be cinched in her COPA airline’s seat and sailing back over the line of the equator! Thanks, everyone, for giving Barb such a warm WordPress welcome! She was touched and possibly a tiny bit dumbfounded at the amazing response to the floor-painting posts. Thanks, Barb, for your tireless energy and for brightening the lives of everyone you met along the way! When I return home, I hope to publish more follow-up reports! Travel well and thanks for spending your special time with us. You were so busy and yet you found time for us too. My sketches are never robed by perfection, your eye has to do more work than my hand. but I could learn a lot about colour from you and your posts. Pleased to get your comment thanks. 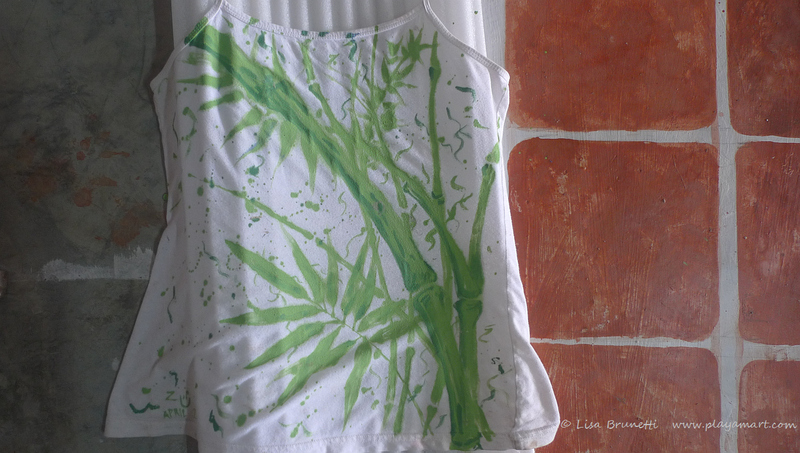 i love taking a ruined piece of clothing and turning it into wearable art! barb’s top turned out well, and it was painted with leftover paint from the hummingbird painting! thank you so much for your kind comment! yes, we had a great visit, and we have so much to show for her three weeks here! 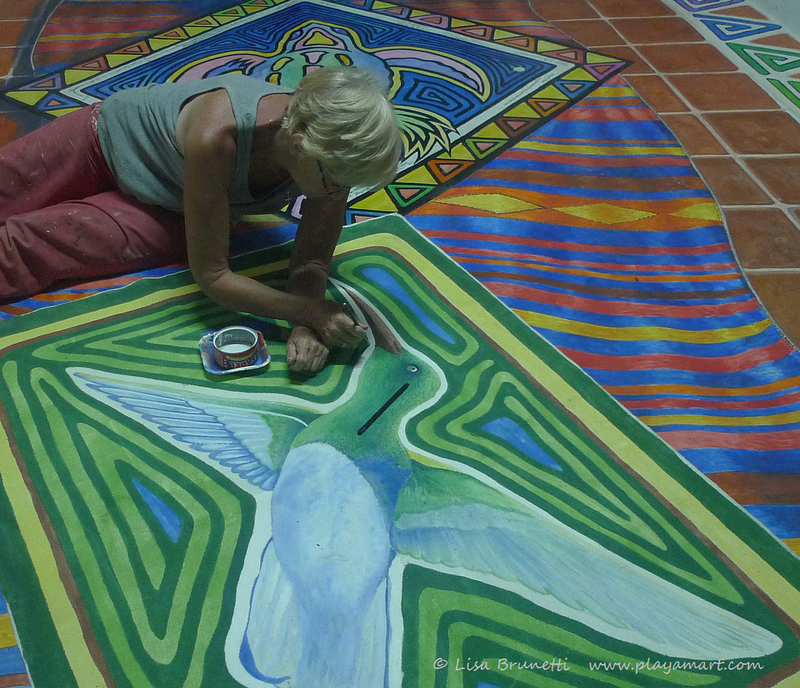 i have an amazing new floor in the studio, and she has a hummingbird painting to smile at her as well! Safe travels, Barb! We will miss you. Love your new shirt! How very creative! Thank you for sharing the beautiful art work. Love the shirt! Safe travels, Barb! Everything looks great! Glad you both had such a good time! hey pat! thank you so much for your comment! yes, we’ve had a great time! It’s been pure delight following the two of you on your journey of creation. Honestly, I can’t believe it’s been only three weeks – as much as you accomplished it seems as though you must have been painting and eating and traveling and playing for three months. Safe travels to you both – can’t wait for more updates! thank you! when i stare at the floor and absorb all that we’ve done, i reflect on how ugly this bodega was six months ago! i’ll have to retrieve all of the old photos that show how it looked at the beginning! it’s come a long way! Thank you for telling us about your time together and showing magnificent work! The shirt is sooo great! 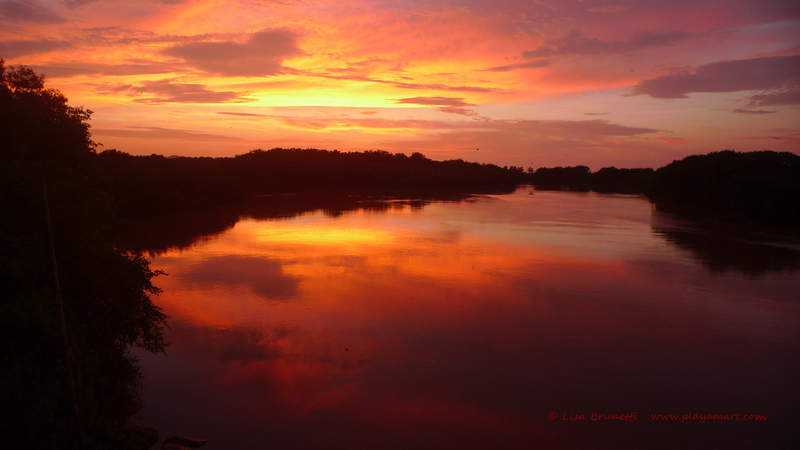 Great recap…I especially liked the little detour to the shrimp farm. Don’t know what they call them in Ecuador, but in Spain they’re gambas (also camarones, but I think the smaller ones are the gambas). Anyhow, looking at them made me wish very strongly for gambas al ajillo. I love what you did with Barb’s shirt. As I say, you will miss her. You make a good team! What a great time you both had and it really was fun to watch the progress. I want a shirt like Barbara’s. What a wonderful art boot camp you have provided, Lisa! Not to mention the delicious treats and scenic excursions. I’m sure that many of us are envying Barb’s time with you. This was a beautiful post – you guys had a wonderful time together. I loved learning/seeing the shrimp catch and their process, seeing Barb’s new tee (that was very cool and great way to save it) and the final post of the beautiful bodega floor. Had a lot of fun meeting Barb through your blog – maybe she’ll start her own.